Say What! Kangana Ranaut performs a wheelie on ‘Mental Hai Kya’ sets – view pic inside! Home Bollywood News Say What! Kangana Ranaut performs a wheelie on ‘Mental Hai Kya’ sets – view pic inside! Actress Kangana Ranaut played the role of Rani Laxmibai in her last film ‘Manikarnika’. She will next be seen in Prakash Kovelamudi’s Hindi directorial debut, ‘Mental Hai Kya’. The movie also features Rajkummar Rao in a leading role. The quirky posters of the movie had roused the curiosity of fans and we now have the Queen star performing dangerous stunts on the sets of the movie in Mumbai. 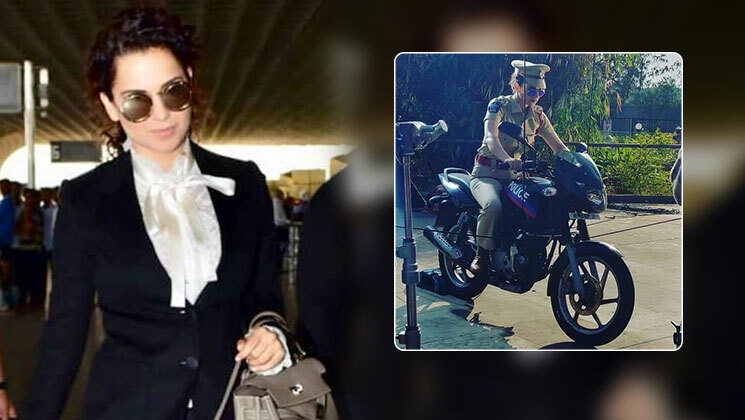 Check out the picture of Kangana Ranaut trying out a wheelie donned in khaki. In the said picture, Kangana Ranaut is seen performing a dangerous stunt on the sets of ‘Mental Hai Kya’. She is seen dressed in a cop’s uniform and acing a wheelie on the bike. Kangana Ranaut looks properly harnessed as a precautionary measure by the makers. She has an intense look on her face as she is seen concentrating on the act. ‘Mental Hai Kya’ is all about hallucinations and illnesses. Apart from Kangana and Rajkummar, the film also stars Amyra Dastur, Amrita Puri and Jimmy Sheirgill in lead roles. The film went on floors a few days back and the makers have been sharing some amazing posters to intrigue fans. The final look ! !sometimes u wanna set fire to ur tongue n some times u wanna stub that over thinking head of urs to flames !!!no???? #mentalhaikya shoot begins!!! On Saturday, Kangana leaves for Delhi to resume work on Ashwiny Iyer Tiwari’s sports-drama ‘Panga’, in which she shares the screen with Neena Gupta and Jassie Gill. Kangana is also rumoured to be taking home a whopping Rs 24 crore for playing Jayalalithaa in her biopic. Also Read: Really – Kangana Ranaut to play an 85-year-old woman?